Back in Time Again. Again. Join me on a trip back to exactly a year ago, when Newcastle were league champions (albeit Second Division – I am still using old terms to describe the divisions after a private trip in the time machine to 1967 to witness the birth of Philippe Albert in person), the news of the World was still mildly respected and Germany were about to play Spain in the World Cup Semi-Final. Join me as I take you back to Berlin, July 7 2010. Please note, no telephones were bugged in the making of this column (either the original or this ‘refreshed’ version). However many Germans were distressed. Located just off the famous Friedrichstrasse (or Arne-Friedrichstrasse, as someone changed one of the street signs to after his first ever goal for Germany on Saturday), the Admiralspalast was opened in 1910. It was originally an entertainment complex (kinda like Whitley Bay Ice Rink, but on a much bigger scale), and became a famous theatre in the decadent Berlin of the 1920s. We arrived there 90 mins before kick-off, having no idea what time it opened. The outside viewing area was open, but, as I’m getting old and wanted to fully benefit from the theatre ‘experience’ (wey, I wouldn’t go for the theatre! ), and not because I’m an ‘old’ 25 (26 (27 now)), we waited to get into the theatre. We spent half an hour waiting by a staircase, indulging in a favourite German pastime – standing still, in front of other people, staring at others. Anyway, we managed to get onto the balcony (thinking it was the only place with seats), and got a canny place to sit near the screen (though wedged in a corner, making beer runs impractical unless you vaulted over the side of a partition, which I only attempted once. Successfully, I might add. I am a fit 25 (26)). For those who like a bit culture, there was a huge chandelier on the ceiling. For those who don’t, they only turned it on during the game – when the other lights were dimmed – so no one paid it any heed anyway. They’d actually set up tables and chairs in the downstairs part, giving the whole thing a kind-of relaxed atmosphere. Sheeeearer! On Jorman telly! Today! Last year. There were about 1,000 people watching at the Admiralspalast (indoors at least), including about six Spaniards and four Koreans. 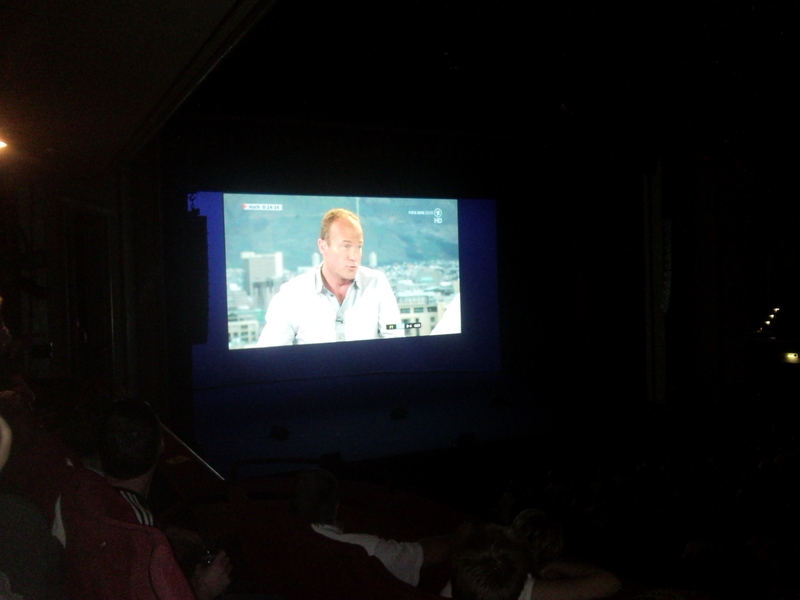 They were treated to Alan Shearer’s opinions on the German team (after the England game, I assume), before the lights dimmed and the anthems started. The crowd had been loud during the anthems, especially during the Spanish one – although not in a good way – before settling into an almost nervous silence after Villa’s chance in the first five minutes, lasting until about half-time. The crowd were actually reasonably quiet during the match as a whole, which is probably due to the majority of those being there were probably over 30, although there were a also a lot of annoying school girls, who were obviously not allowed to go to the Fan Mile. I wouldn’t wish that on anyone. On the hour mark, however, panic set in on a great, and incredibly audible, level. Spain had three chances within a minute, and everyone present knew that Germany should have been behind by now. A graphic on the screen came on to announce that Germany had had two shots on goal. Spain had had 11. The introduction of Kroos seemed to give the fans a lot of hope (although I did think Trochowski was playing well), and he was immediately involved in the game, always looking lively. Unfortunately, and I’ll admit I was supporting Germany again, he placed his shot gently into Casilla’s grateful arms when presented with a clear chance. The crowd really picked up in the wake of this miss, singing constantly – albeit the same two songs on repeat – and Germany were in the ascendancy. A hush broke over the audience. Except for the idiot schoolgirls, who seemed to be singing just to make noise. As soon as Gomez was brought on, it was obvious that Germany were screwed. He’s like Heskey without the good points. How Spain didn’t get a second is beyond me, and I think everyone realised at the end that Germany had been outplayed. Bettered, but not embarrassed. This entry was posted in Football and tagged A favourite German pastime, Admiralspalast, Berlin, Chandeliers are wasted on me like, German arrogance, Germany, Jogi Loew and Hansi Flick's homosexual relationship, Mario Gomez is a poor man's Emile Heskey, NUFC, Paul the Octopus, Sheeeearer, Spain, The birth of Philippe Albert, The death of the News of the World, Time Travel, Today, World Cup 2010. Bookmark the permalink.